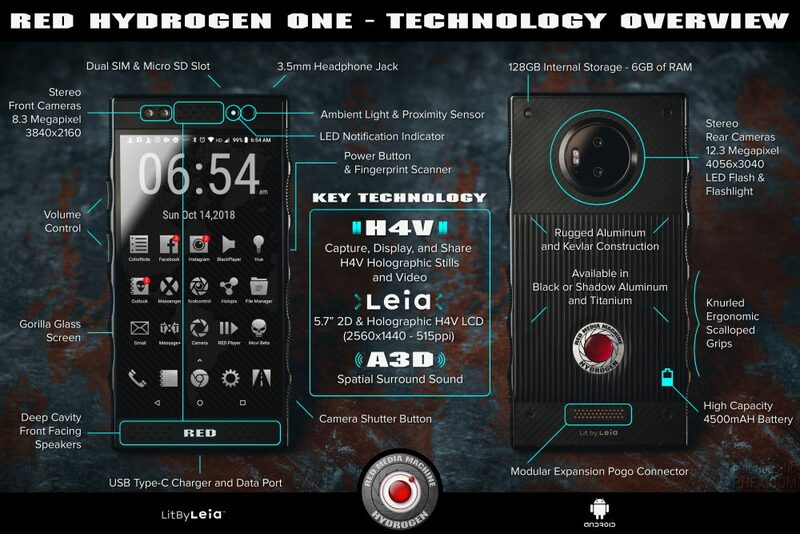 Red hydrogen one is perhaps one of the most mysterious phones we came across last year. Even after a year it was announced the complete specifications were not known to the public. However thanks to the recent leak courtesy 9to5Google, the entire device has been, with most certainty, laid bare. The parent company Red has progressively moved on from professional camera equipments to smartphone camera integration with the Hydrogen. Interestingly they also provide Studio services in Hollywood, California. However their reputation for making rugged high end camera equipments has been appreciated and acknowledged by notable artists like Marquess Brownlee. This company is for the camera enthusiast, which can clearly be seen by the devotion they have not only to the equipments they manufacture but also the various online series they’ve published teaching their buyers about their technology. You can follow it on their website under the series name Red Tech. Coming to the Hydrogen, the device includes a few of Red’s core technologies in the form of the H4V week holographic video and still image capturing systems. The front sports a 5.7 inch 2560 x 1440 pixel H4V holographic display. The front has an 8.3 megapixel 3840 x 2160 resolution camera, ambient light and proximity sensor, LED Notification indicator and all this is protected by a Gorilla Glass screen (version undisclosed). The left side sports the volume control and the right side sports the power button and fingerprint scanner. The placement of the fingerprint scanner is an interesting choice but this choice can be explained by the parent company Red since the phone is for camera enthusiasts and will be used in landscape mode dominantly, the placement of the fingerprint sensor makes sense. At the back we have the 12.3 megapixel 4056 x 3040 camera along with the LED flash and flashlight. The cameras will hopefully be the main event with the Red Hydrogen One. Much like the Motorola devices, the cameras will play host to dual 12.3 megapixel sensors that are capable of capturing holographic video and still images. Going by its reputation a dedicated shutter button and grippy sides have been allotted to help the avid camera user since after all this is a Smartphone made by a predominantly camera first company. An interesting feature of this phone is modularity. Modules will make this phone a much more personal device which is an interesting step forward given the phone is a very personal element. This will also boost the ability to add more video and photo taking capabilities to the normal user. It comes with a massive 4500mAh battery. USB type C will be included as standard which is pretty much par for the course at this point in 2018. We already knew that the Red Hydrogen One will run on the Snapdragon 835 chipset but now we also know that the 6 GB of RAM and 128 GB micro SD card expandable storage comes as standard. The official release dates haven’t been announced so we will have to wait and see when this device starts shipping.